Aerodynamicists are often asked about ways to improve the performance of race cars using golf ball dimple effect, shark skin, riblets, super smooth surface finishes, bumble bee effect (hairy surfaces), etc. This is asked so often that we have decided to dedicate a small document to the subject, to explain some of these effects. Zipp Speed Weaponary, one of the world’s market leaders in racing bicycle wheels hold the world patent on dimpled disc cycle wheels, and they seem to work, being chosen by a number of top teams including some Tour de France front runners. 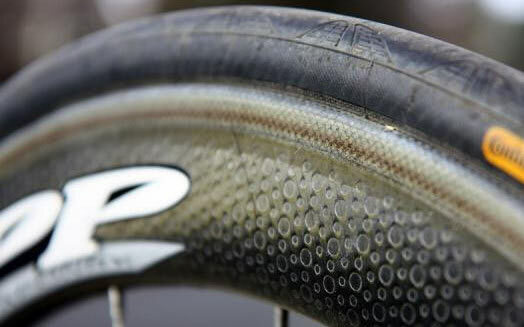 Zipp use a roughly meniscus-shaped dimple with a flat bottom that sweeps upwards near the edges. Apparently this shape is popular in current golf ball design, particularly with manufacturer Titleist. Businesses exist and some even thrive on the promise of improved downforce / lift or reduced drag, or sometimes even both, using surface finish related treatments. We think surface finish is important but not as fundamental to race car performance as some people suggest. For some objects operating with different shapes and at different speeds, the importance can be much greater, eg a human swimmer, runner or cyclist (at one end – due to low speed mainly) and an aircraft (at the other end of the speed scale and due to skin friction drag). For different reasons surface finish can be very important. Laminar (efficient, powerful, ideal but potentially unstable and rarely seen for any length of a surface on an F1 car for many reasons – e.g. surface imperfections caused by running for many laps in the real world, the extreme shapes employed in F1 to generate downforce, following other cars, etc.). Catastrophic flow separation is possible directly from laminar flow regions and laminar flow is easily disturbed by surface imperfections. Transition to... turbulent (less efficient in theory but more stable or more likely to ‘hang on’ to a curving surface). As turbulent flow is pushed more and more, sometimes a separation bubble starts to form (bubble implies that the flow attaches again further along the body). Sometimes off-body separations appear in the flow region while the flow still seems to be (just) attached ‘on-body’. Asymmetric 3D flow – i.e. remaining surface flow starts to go asymmetrical and sideways compared to global airflow direction – usually this is because one vortex of two has burst and usually some separation exists next to the asymmetric flow. Full separation of the flow from the body. The impact of golf ball dimples is going to be our primary focus but, when you have a clear understanding of this, it should be faster and easier to understand the impact of other surface treatments. The same concept of dimples is also used on some other sporting goods where it is possible to make a difference, sometimes quite big. To explain we need to convey some basic principles because not all of this is simple. All other things being equal, the aerodynamic drag of an object increases with the square of speed (twice the speed means four times the drag force). For this reason many objects (including cars) are often characterised with a drag coefficient or the drag coefficient x the frontal (or cross sectional) area for the body (i.e. 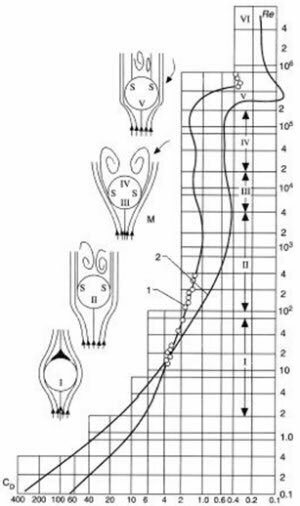 the size of the body) and for simple checks these numbers can then be compared to see which body has more or less drag. However, the drag coefficient of an object does not always remain the same as speed is changed, especially at quite low speeds or for small objects and for very high speeds (e.g. approaching the speed of sound). 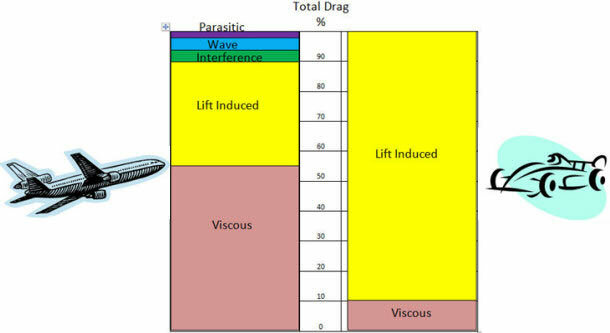 These changes in drag (coefficient) come about because the way the air behaves changes as speed and size are changed. Aerodynamicists, when talking about air speed and body size, talk about Reynolds numbers which is a non-dimensional number (basically speed x fluid [air] density x length of object ÷ viscosity of fluid [air]) that helps us to understand about boundary layer and flow types around the body. Golf balls have been scientifically compared to round spheres in a number of studies. One that I found useful gives the following graph of drag coefficient vs. Reynolds number (but you can think of this as drag coefficient vs. speed). 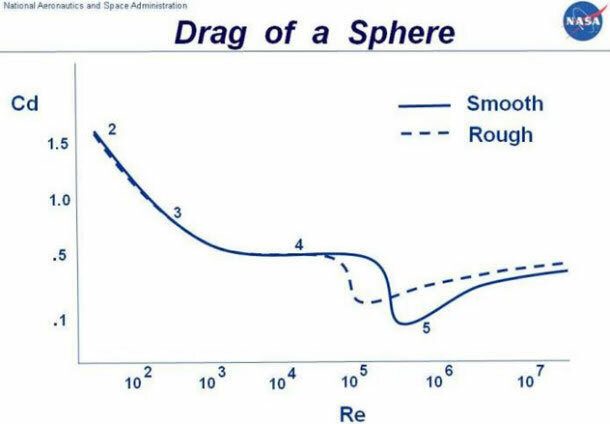 From the graph you can see that the drag of a smooth and a rough sphere swap over as the Reynolds number changes. Given golf balls are used in atmospheric air and the balls are all the same size then we are talking about speed changes. At some speeds the smooth sphere will have less drag – at some speeds the smooth sphere will have more drag. The difference can be above 25 % of the drag of the object in a given set of conditions. High performance computing can be used to address important problems related to science and engineering but also for fun. Here was used parallel Navier-Stokes solver to compute the flow around a golf ball traveling at speeds up to 100mph. The computations are amongst the largest Direct Numerical Simulations of complex flows ever performed, involving billions of grid points and thousands of processors on large parallel clusters. Our aim is to illuminate the detailed mechanisms by which the dimples dramatically reduce the drag force on the golf ball over a narrow range of speeds. 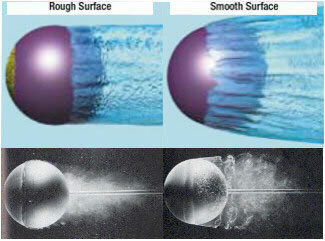 The most realistic way to reduce the drag on a golf ball is to trip the boundary layer. This is done by using dimples, ie creating a rough surface that promotes an early transition to a turbulent boundary layer. 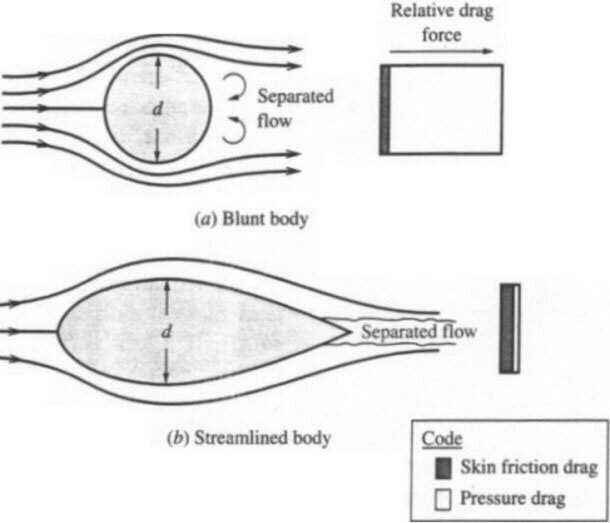 This turbulence helps the flow remain attached to the surface of the ball and reduces the size of the separated wake so as to reduce the drag it generates in flight. When the drag is reduced, the ball flies farther. The best way to reduce drag on an object can also depend on the control that can be imposed on the direction of airflow. For an aircraft or a car, airflow direction can, to a greater or lesser extent, be predicted. Extremes of cross flow or reverse flow are not as frequent so are not given the same weight in the process of performance optimisation. The reason we do not see dimples on other shapes, like wings, is that these particular forms of boundary layer trips only work well on a blunt body like a sphere or a cylinder. The most dominant form of drag on these kinds of shapes is caused by pressure. More streamlined shapes like the airfoils used on wings are dominated by a different kind of drag called skin friction drag. These streamlined bodies, like that pictured above, have a teardrop shape that creates a much more gradual adverse pressure gradient. This less severe gradient promotes attached flow much further along the body that eliminates flow separation, or at least delays it until very near the trailing edge. The resulting wake is therefore very small and generates very little pressure drag. It should also be remembered that, in a race, an F1 car is bombarded with sand, stones, insects, balls of rubber and other debris which can change car performance notably. A lot of research would need to be carried out to find out if and where different types of a surface finish might improve the car. Past experience, including short-term positive experiences with surface finish changes, taught us that revising the shape was more effective than revising the surface finish. Covering a whole vehicle with the any single treatment would not be practical or beneficial. We have invested in this research in the past and spent some money and energy on it again in 2012 but this did not lead to an improvement. From time to time we believe that, due to new information, we have a chance to improve performance in this way. However, so far we have not found permanent improvements using this technique. Most teams in F1 have had the same experience as Sauber. There are many references relating to this subject that can be found on the internet. We have used some in the creation of this short explanatory document.